When you visit our pediatric dentistry office, your child's health and smile are our top priority. Our entire team is dedicated to providing you with the personalized, gentle care that you deserve. Dr. Brett Wilson is a pediatric dentist who specializes in providing oral healthcare to children of all ages. Learn more about Dr. Wilson. 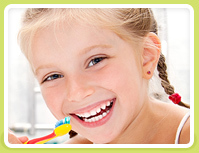 Pediatric dentistry primarily focuses on children from birth through adolescence. Contact our office today to learn more.